The team at Verity Audio have been hard at work on an upgrade that is sure to improve the sound of their already stellar speaker line up. 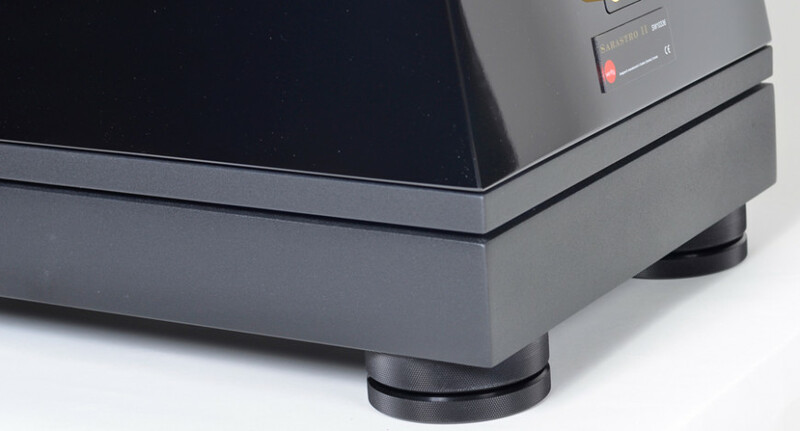 The upgrade which can be easily retro-fitted to a range of current and older model Verity Audio speakers is a plinth like platform that replaces the traditional gold footers and spikes. During the CES 2013, Verity Audio released the new Lohengrin IIS loudspeaker system. With the introduction of the Lohengrin IIS, Verity Audio launched a high technology floor isolation platform replacing the former system based on brass cones and stainless steel spikes. This new platform efficiently heat transform a wide spectrum of acoustical and mechanical energy susceptible to be transmitted to the floor. This is done via an elaborate arrangement of constrained layer materials. Simply said, it mechanically and acoustically floats the loudspeaker from the floor. The platform fits perfectly to the loudspeaker shape and sits on (4) four large leveling aluminum feet (see article picture). The result is a major improvement in the clarity and intelligibility of the low register greatly enhancing the sound homogeneity of the complete system. The platform updates install easily and quickly giving to the customer immediate satisfaction and unambiguous sound improvement. Also, as an additional benefit, we truly believe that they greatly enhance the product look and stature. It comes in black having the same finishing found on the isolating monitor plate. We invite all Verity Audio owners interested in purchasing this upgrade to contact us for pricing and further details. They are available to order now.